Do you have a dream? We can help make your dream come true. Donations to the Springfield Symphony Foundation assure the continuity of the Symphony’s high artistic standards and help close a major gap between ticket sales and expenses. Each and every gift makes a difference. A gift to the endowment lives forever and grows over time so that future generations are assured that the sound of live music will resound in our community. Give Securities Instead of Cash. Give stock that you have owned for at least one year and have gone up in value. You can deduct your cost, plus your capital gain up to 30 percent of your adjusted gross income. Provide a Life Insurance Policy. You can transfer ownership of a policy to the SSO or buy and contribute a new policy. Such a gift will entitle you to an income tax deduction and future premium payments will be tax deductible. Make Gifts from Your Business. Owners of closely held corporations may consider contributing stock in their companies. In some cases, it may be more favorable for the corporation to make charitable gifts. Make “Temporary” Gifts of Cash. A Charitable Lead Trust will allow the SSO to “borrow” assets for several years with the assets later passing to children or grandchildren. This option can reduce income and estate taxes. Give IRAs and Pension Funds. Your estate can save income and estate taxes if you make the SSO the death beneficiary of your retirement plan. You may also arrange for lifetime income to be paid to a family member after your death, with the SSO benefiting later. *A 5% annual return on your bequest would ensure that your thoughtful annual gift will continue. Please consult your attorney or financial adviser for more information about your specific estate plan. For more information about The Springfield Symphony Foundation please contact Ted Vander Roest of The Springfield Foundation at 937-324-8773 or email him. Download a brochure here. 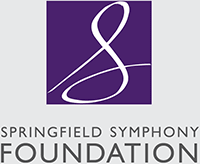 The Springfield Symphony Foundation was established in 1968 to raise and manage money for the support of the Springfield Symphony Orchestra.